And the NCD saga goes on, and on . . .
After 10 different public meetings and many smaller meetings, the subject of Coconut Grove's zoning, in the way of NCD changes and rewrite (PZ.9) were discussed at Thursday's City Commission meeting. There was significant public comment, and there was such a large turnout by the residents, that people flowed into the lobby. People spoke about the two NCD's - NCD3 which is most of the Grove and NCD2, which covers Village West. The proposed NCD changes are at this link. In the end, it was deferred until February 28; a total disappointment for many Grovites who have worked on this issue for years and who had planned for a passage on the first reading Thursday night. The Grovites were slapped down again, after sitting and talking and pleading for hours for the Commissioners to save our neighborhood. In Village West, most are against the changes that are displacing long time residents and are in favor of the revised NCD2. This is the biggest disgrace. The Village West is the birthplace of Coconut Grove. Many neighbors are descendants of Grove pioneers. They are being displaced, thrown out, over-taken by greedy developers. Commercially-zoned properties, which were once apartment buildings, are allowed to be doubled in size in the current NCD2, it is not the same with homes, where proposals are to reduce the zoning sizes. So apartment buildings have been destroyed and commercial development is moving in. Many older Village West residents spoke of the old days, of the culture that is being lost, they talked about the greenery - Village West had every kind of tree you could imagine. Now it's all cement. South Grove residents Kathy and Don Kesler started the comments off about the NCD3, with a show-and-tell with large images of their neighborhood; they explained how greed has destroyed their neighborhood because of start and stop construction, for 10 years an empty lot sits where a beautiful old house with a carriage house sat. The issue from neighbors who spoke seems to be the size of the structures being built next to their houses that are over-sized and out of scale. Trees are destroyed in the process. This is the main issue concerning Grove residents. "They're going set-back to set-back," said one lady. Residents feel that the Grove canopy is disappearing. "The essence of the Grove is disappearing," said one speaker. Property values are going down, not going up due to the over-sized house and loss of trees. "Developing these sites at 80 to 85% of the land does not allow room for greenery. There is no room for water, for growing for tree development," said one landscape architect. Resident Andy Parish said the purpose of the NCD's is to fine-tune the neighborhood. He said that Miami21 does not accommodate every neighborhood. The City of Miami is entrusted by the state of Florida to enforce regulations and the health of its residents. Steve Mason of the South Grove complained about the character of the Grove changing over the last 10 years. He brought up The Kampong and how FIU is trying to open a new campus at The Kampong. A campus, with parking students, lighting and more in the center of a peaceful resident neighborhood. Resident Ron Nelson said the NCD was developed to protect the neighborhoods, it was started at the time the McMansions started invading the Grove in 2008. It was adopted in 2010, but was unenforceable. Now we are back trying to add teeth to it. Resident Nathan Kurland said that the current NCD codes have not protected the Grove. "They are too vague and filled with loopholes. Coconut Grove is a special place." Property values are high, adding zero-lot houses on small lots do not bring property values up. "We need tree canopy protection," said Nathan. "We need to curb over-development." John Dolson, South Grove resident said that historically the FLR (Floor Lot Ratio) in the Grove was 35%, now it's 50% and the upper end has not been capped, which allows over-sized homes. 65% now is the status quo in the code now. Community workshops would like the FLR to be 35 to 40%. "Keep the grove in Coconut Grove," said John. One person said that "Developers are extracting the value of our homes with every over-sized structure and tree demolition." John Snyder of the South Grove said that, "The expressed intent of NCD3 is to protect low density of the neighborhoods." He says it is easily enforced in Coral Gables. Why not here in the Grove? Architect Ken Treister spoke against the NCD3 changes. He felt the FLR ratio should be 80%, not 50%, because he says the houses being built would be too small at 50% ratio. But the point of the whole issue is, residents in favor of the NCD changes want the houses left alone. They want people in the Grove who want to be in the Grove, NOT people who want to come in and knock down houses to rebuild and start something new. If people want larger houses, then the Grove is not for them. Resident Joyce Nelson, explained that she lives in a small house that is paradise. It's not 5000 square feet, but it's paradise. She agreed that if someone wants a 5000 square foot house, then Coconut Grove is not for them. Very few people spoke against the NCD changes. The main consensus is to protect the character of the Grove, to stop tree destruction and stop non-stop development of over-sized houses. Laws need to be enforced, as of now they are not being enforced. Tucker Gibbs, a Grovite for his entire life, 65 years, asked that the NCD3 pass on the first reading, then have a Sunshine meeting or two afterwards. Then come back and get it all on second reading and vote. A few people asked for a deferment in order to get an economic impact analysis before anything is finalized. One man asked for a moratorium on building if there is a deferment, that is an excellent idea. Put it all on hold if there is a deferment. 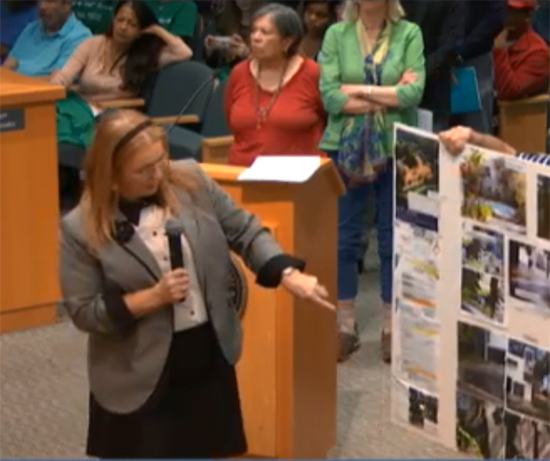 Activist Grace Solares spoke, she asked that the commissioners not listen to any of the developers that spoke Thursday night, as they don't care about the neighborhood, she said, they are only there to make a buck. Thelma Gibson, from a pioneering family in Village West was one of the last to speak. Her grandfather bought the second peace of property on Charles Avenue at 3326. Mariah Brown bought the first piece at 3298. Mrs. Gibson called the Grove, "a quaint old place." She is in favor of the passage of the new NCDs. And asked that the City Commission make "this a better place for all of us." In the end, Commissioner Ken Russell asked for passage on the first reading, he told the other commissioners that when they need him to protect their neighborhoods, he would be there for them. Now he needed them to be here for him (and the Grove). He practically begged them to vote in favor of the NCDs. Commissioner Joe Carollo, who seemed to be away from the dais for most of the meeting, asked for an election regarding the issue. An election where Grovites would vote. The 100 or so people who spoke Thursday night, did not convince him. "Let the people of Coconut Grove decide what they want to do with this," he said. He felt that the five commissioners did not have the right to decide the fate of the whole Grove. Is he afraid of the developers? They seem to be the only ones in favor of over-development. The five commissioners are always throwing their weight around on all issues, now for this one issue he wants a community vote? In the end the issue was deferred until February 28. There will be a sunshine meeting some time before February 28. I didn't hear anything about a moratorium, so the developers are still not in check. They may want to negotiate wiggle room for loopholes allowing developers to continue getting away with warrants and keep the new legislation unenforceable. Moey talks and voters walk! It gets more obvious every day that, until can demonstrate to these elected City Commissioners that we can deliver more votes to the candidate who is in line with our goals than they can buy with developer’s money, nothing will change. I like the idea of allowing the residents to decide by having an election. It guarantees a fair outcome. Enforcing the lobbyists rules might help. Someone took a photo of a known lobbyist speaking to a commissioner’s staff member, outside the meeting area. I believe the lobbyists are supposed to sign in. I would support a more level-headed NDC proposal. The current proposal would affect my pocketbook by disallowing splitting of lots, it would affect freedom by imposing an architectural style, and does not pro-actively save the canopy, as there is no specific tree requirements. The proposed NCD needs further modifications to make it work. The "known" lobbyist "signed in" and spoke last night. And identified as such. So why are you spreading false information? Check out the video of the meeting and you'll see for yourself. And the Grapevine might want to do the same. Some of your information in this post is incorrect. The bottom line, though, is that the community is going to have to come together and make concessions on both sides. It's not going to be a win-lose. It's got to be a give-and-take because no one will ever be 100% in agreement about what the percentages should be for building mass.